Before Bharathiraja entered the film world, village life on screen was a sanitised and unrealistic caricature. But in 1977, Bharathiraja took the camera out of the studios and captured village life with a rare sensitivity and respect for its reality. His mother Karuththamma received the National Award from the President on his behalf for his film named after her. Among his other landmark films are Muthal Mariyathai (with Sivaji Ganesan in the lead), Karuththamma, Alaigal Oyvadhillai, Mann Vasanai, Vedham Pudhithu, Kizhakku Cheemaiyile and Anthimanthaarai. Bharathiraja is credited with launching the careers of the several influential people in the Tamil cinema. He is married to Chandra Leelavathi, and they have two children - son Manoj (the hero of 'Taj Mahal') and daughter Janani. Bharathiraja started his film career as an assistant to director P. Pullaiya and Kannada film maker Puttanna Kanagal. Eventually working with Krishnan Nair, Avinasi Mani and A. Jaganathan, he learned the grammar of film making and got his first directorial opportunity in 1977. His first film 16 Vayathinile for which he wrote the story and the script broke convention to create a new genre of village cinema. Costumes were uncomfortably true-to-life, dialogue was as-is-spoken, and village characters were tellingly genuine. As Bharathiraja himself agrees, the film was expected to bring in lots of accolades - which it did - but to do moderate business at the box office - which it did not. The film was a huge commercial success and kept the cash registers jingling even after several re-releases. His next film Kizhakke Pogum Rail produced similar results and eventually brought in criticisms that Bharathiraja was capable of catering only to village audiences. This led him to make Sigappu Rojakkal, about a psychopathic woman hater that was totally Westernized in terms of both conception and production. But contrary to what several observers expected (and wanted), this film met with great box office success as well and everyone agreed that Bharathiraja was here to stay. Bharathiraja confirmed his versatility and refusal to be tied down to one particular genre with an experimental film Nizhalgal and an action thriller Tik.. Tik.. Tik. But, undoubtedly rural themes proved to be his forte as his biggest hits in the 80s Alaigal Oivadhillai, Mann Vasanai and Muthal Mariyathai were strong love stories in a village backdrop. Of these films, Muthal Mariyathai deserves special mention. The film starred veteran actor Sivaji Ganesan in the lead, playing a middle-aged village head. Radha is a poor young woman who moves into his village for a living. The love that bonds these two humans, separated not just by age but also by caste and class, is told by Bharathiraja with poetic touches. Without doubt, this film remains one of the most successful films for both himself and Sivaji Ganesan. Bharathiraja's Vedham Pudhithu dealt with the caste issue in a stronger manner. The film's narrative was seamless and starred Sathyaraj as Balu Thevar. It contains some of Bharathiraja's trademark touches as well as several ground-breaking scenes. However, it does follow the anti-Brahmin trend common in Tamil films - in this respect it departed from his earlier success, Alaigal Oiyvadhillai, where the caste and religion factor was given a more balanced treatment. 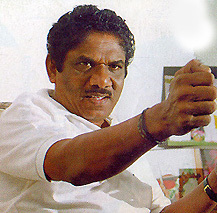 Bharathiraja has successfully managed to modernize his film making techniques for the 1990s. The commercial success of Kizhakku Cheemaiyile and the awards Karuththamma garnered stand as testimony for his ability to thrill the younger generation as well. His mother Karuththamma received the National Award on his behalf from the President in 1994 for the film named after her. Bharathiraja was on the same stage in 1996 to receive another National Award for Anthimanthaarai. From the day 16 Vayathinile was released in 1977, Bharathiraja's path has inspired several young filmmakers. He has plans of making short films with varying themes to attract the international audience and has currently completed his latest venture Kadal Pookal and picked up a national award for the best screenplay writer for the same film. The well-known Tamil film director Bhagyaraj was one of his assistant directors. He has directed movies in Malayalam, Telugu and Hindi also.